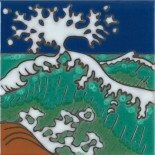 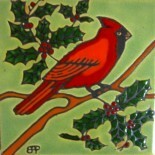 These ceramic tiles are all our own original art designs which our family has been creating for over 30 years. 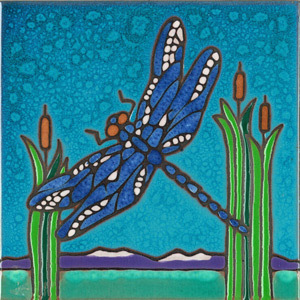 Each art tile is individually hand painted then "fired" in our kiln to 1800 degrees until the vivid, jewel-like colors emerge for you to enjoy as a painting or as a useful hot plate. 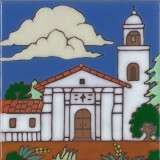 We pride ourselves on our attention to detail with added color nuances that make each tile special. 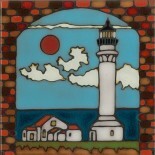 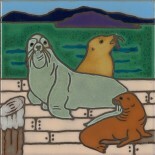 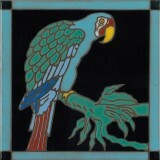 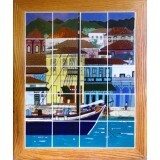 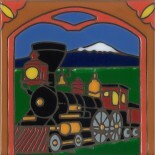 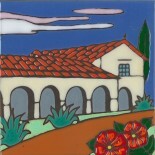 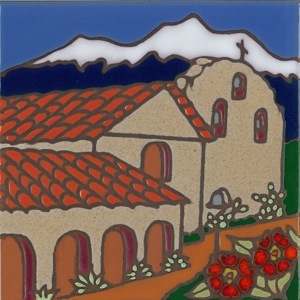 Shop our collection of over 20 different California Mission hand-painted tiles. 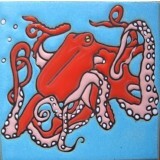 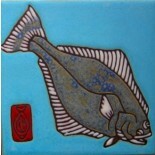 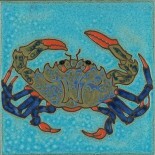 Shop our collection of over 30 different hand painted Sea Life tiles. 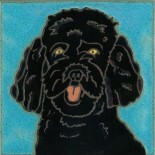 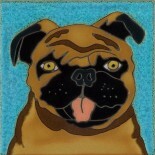 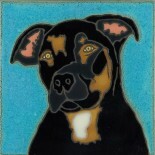 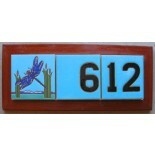 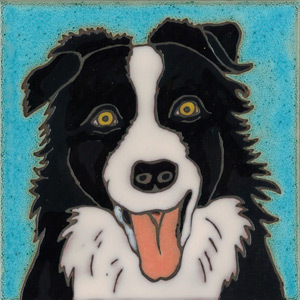 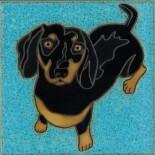 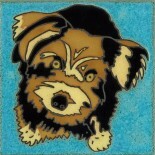 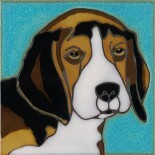 Shop our collection of over 20 different Dog Collectors Tiles. 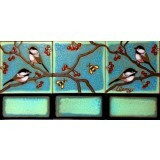 Shop our collection of over 30 different Nature & Wildlife hand painted art tiles. 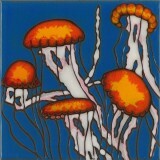 Now I have seen these little guys up close and personal in the kelp beds off of Catalina Island. 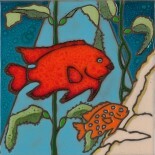 They look like a giant Goldfish and their babies have these beautiful iridescent blue spots which fade away as they get older. 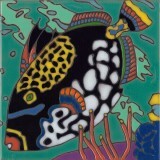 They live off the coast of Southern California and Baja and are the official state Fish of California and are protected. 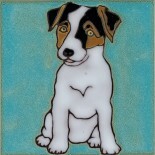 An adorable Jack Russell puppy awaits you on this pretty hand painted tile. 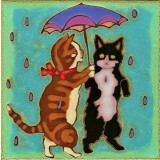 We live on 5 acres with a large pond with an island in it. 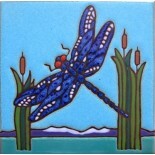 Every summer there are hundreds of iridescent dragonflies that swoop down to the pond and land on the cattails. 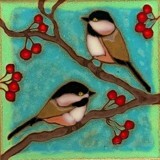 I would just go right up to them and take a good look at their most magnificent intricately webbed wings. 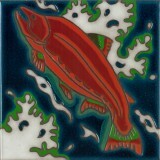 I feel I have captured their elegance and translucent color scheme in this tile design, one of my favorites. 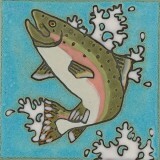 The Emperor Penguins are the tallest and heaviest of all penguins (4 foot tall and 50 -99 lbs). 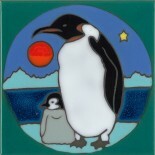 They are the only penguin who breeds during the Antarctic Winter. 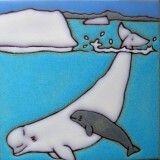 They trek up to 75 miles over ice to mate and feed their offspring. 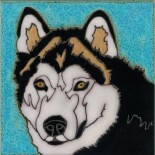 They withstand temperatures of -40o F and winds of 89mph. 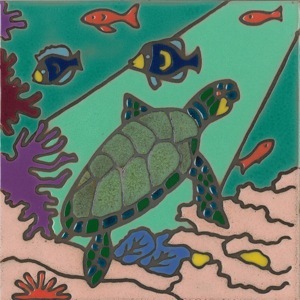 The male incubates the sole egg for two months straight without eating anything @ all while the female returns to the sea to feed. 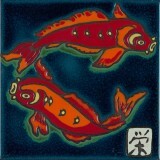 Both the male and female lose 60% of their body weight while raising their offspring. 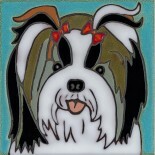 Their fuzzy chick is covered with silvery grey down feathers to keep him cozy! 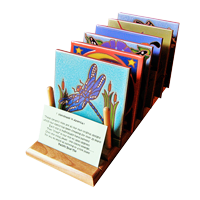 When I was traveling in Costa Rica I actually got to see some of these endangered frogs and I just loved their built-in tropical color schemes. 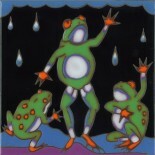 They are wet little animals who live in the Rain Forest so I drew them dancing in the rain! 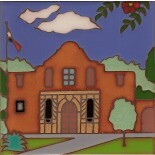 This is the famous Mission known as the "The Alamo" where the famous Texas battle for independence was fought in 1836.